4 excellent indoor playground themes for kids to have a blast! In the playgrounds, we usually see children running, chasing, and screaming like they have a bottomless well of physical energy. Especially when they step into those indoor playgrounds with attractive indoor playground equipment. 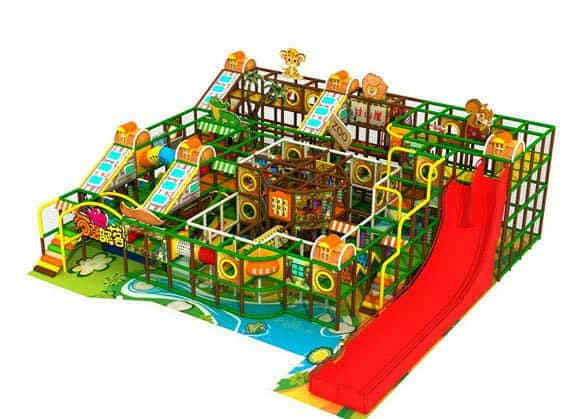 Facing the fascinating indoor playground themes, they will be absorbed into the surroundings deeply. Although they might still feel exhausted sometimes, it’s a period every little child has to experience in their whole lives! According to the America Heart Association, a child older than 2 should perform physically strenuous activity at least 60 minutes every single day. Only given enough exercising time, kids will grow in a healthy and happy environment. It is a fundamental need for a child to have some social development and childhood exercise on playgrounds. Considering the important role an indoor playground plays in children’s life, indoor playground themes will be important. Generally, the commercial indoor playground ideas make the state for creating a healthy environment. In such an environment, kids can participate in different kinds of activities for amusement and entertainment. They can easily have fun with soft play equipment. Also, parents will get a little break from their daily job because the field stuff will take over the kids. Actually, for many kids, indoor play space is just a canvas for them to emancipate their imagination freely. Considering this, you should make your play park a place that revolves around attracting theme, physical exercise, imagination development, and visible sensory exploration. Particularly with wonderful themes, your playground will be more entrancing. So, we have listed several thematic ideas that will help you with the decoration of your playground. when it comes to the pirate topic, thinking about captain jack sparrow. An amazing man in the pirate world! Pirates are always cool for the child. Try to get a ship on the open ocean in your park, then kids will run onto the ship to become a real pirate in their mind. Also, the child will board on the ship and begin their trip to find the treasure hidden in somewhere on the earth. Except for the ship, the playground floor can also be painted like water for kids to talk a walk on it. To be an astronaut seems to be a common dream for most of the young kids. To help them live up to their fancy dream, you can just put a spaceship in your indoor playground. Actually, deep sea shares the same dark colors with lucky space. So, the bottom of your play park can settle up under the sea with the upper in space. The spaceship settled between far below and far above, will open a mysterious word for those curious kids. There is such a theme park locates in California. When you step into their park with delicate decoration, you will find it a “farmhouse”! From the outer signage to the indoor playground equipment and to the beautiful party room. 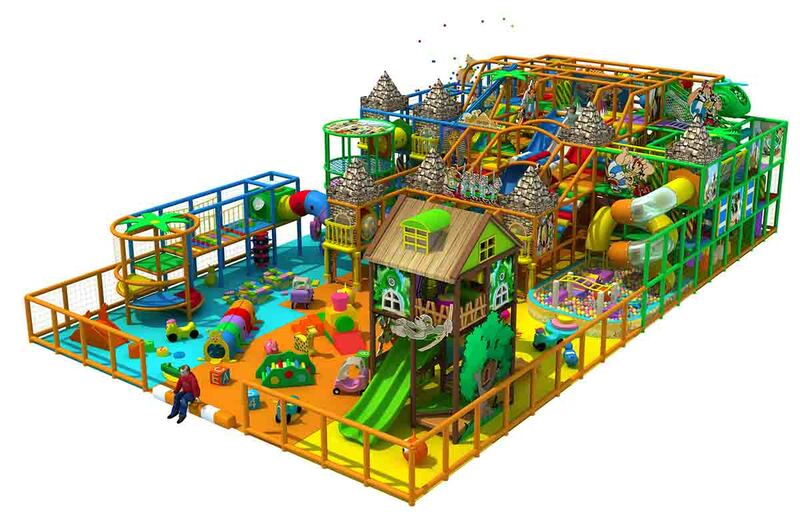 Placed in this indoor play park, kids will feel like they are roaming in the field. This kind of consistent theme will not only help kids and parents to relax but also enables the business to go better and better. Guess what you will see in such a theme park? Jousts, dragons, princes, princesses and so on. The physical structure of this indoor playground looks like a castle, around where there is a group of a dark forest. In this stronghold, kids can find secret passages, dungeons and tunnels and all of this will inspire their original curiosity. Also, park owners can arrange an epic battle for kids to see all kinds of simulated mythical creatures. 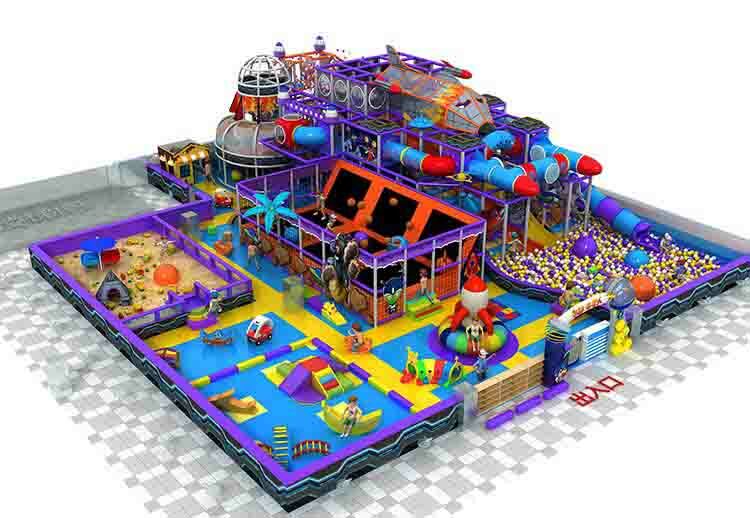 All of this these indoor playground themes may sound like a stretch for you, but they don’t. To come true these wonderful indoor playground design, business owners or those park designers should just hop out of their normal adult-mind, then, think in a child- mind. To achieve this transforming, you can think back to your childhood time and channel that creativity. Although the equipment itself can produce fun for kids, the additional artistic themes will bring the inanimate structure to alive. While the structure in your indoor playground is breathed into life, kids can develop their imagination maximally. In conclusion, more fun in your park, happier both are kids and owners.